Hivos > Uncategorized > The Hivos Social Innovation Award went to …. The Hivos Social Innovation Award went to …. 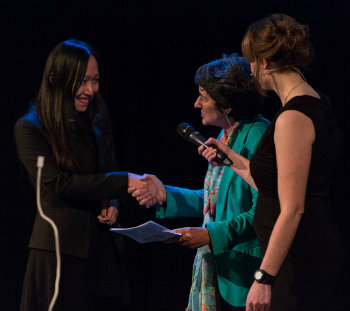 On 5 February 2015, the jury announced the winners of the Hivos Social Innovation Award 2014. During an inspiring evening in Amsterdam facilitated by Hivos, six finalists took central stage and shared their innovations with a live audience of 125 VIP guests and some 300 viewers through the livestream. Design students from the Sandberg Institute gave the event its look and feel, which you can see in the recording of the livestream on hivossocialinnovationaward.org. The chairperson of the jury, former Hivos CEO Manuela Monteiro, told the audience how impressed the jury was by the number of submissions (400): “The apparent drive of these innovators to contribute to more open, democratic and green societies is heart-warming and encouraging”. She added that creativity is the key to social innovation, but also, “if you don’t fail you will never get anywhere”. Quality, degree of innovation, social impact and sustainability are the criteria of the Social Innovation Award. The jury had the task of selecting the proposals that best meet these criteria in two categories: a promising innovative idea to be developed into a prototype, and an initiative that has already proven itself and deserves to be scaled up to increase its impact. Bonnie Chiu from Lensational was selected as the winner in the prototype category. The jury based its choice Lensational’s simple, but very modern and viable way of empowering poor urban women in Pakistan with – recycled digital cameras. They were also impressed by the fact that Bonnie Chiu, only 22 years old, has already developed a sound social enterprise and managed to engage with a wide array of stakeholders. Jury chairperson Manuela Monteiro announced that in the scaling-up category, however, the jury did not find an obvious winner. While undoubtedly valuable, none of the innovations had yet reached the stage at which they could be scaled up. The jury did see considerable potential to scale in one proposal and, in consultation with Hivos, decided to offer a coaching trajectory instead of a prize to Tanveer Hossein from Organic Sack Gardening. According to the jury, this innovation has the potential to make the megacity of Dhaka, the capital of Bangladesh, a greener and healthier place to live.